The Joker has never been the type to play it safe; not when it comes to facing off against Batman and especially not when it comes to his fashion choices. 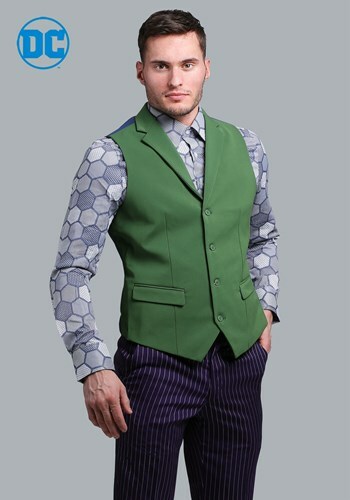 The Joker suit vest is an authentic look inspired by the Dark Knight Trilogy and it’s for those who like to throw caution to the wind. After all, great style isn’t crafted by the timid or those afraid to take risks! This lush, green vest is made of 100% polyester and brings a dash of playful color to any formal event. The vest has an adjustable back strap, allowing you to get a stylish fit. It’s designed to match The Joker suit pieces, so it pairs perfectly with the other pieces to create a cinematic fashion experience. It’s perfect for a stroll through Gotham City, or a high society fund raiser being held at the top of the Wayne Enterprises building.